St Katharine Docks’ Devon House will play host to The Thames: The ARTery of London, A contemporary art and sculpture exhibition, 4-18 December 2016. 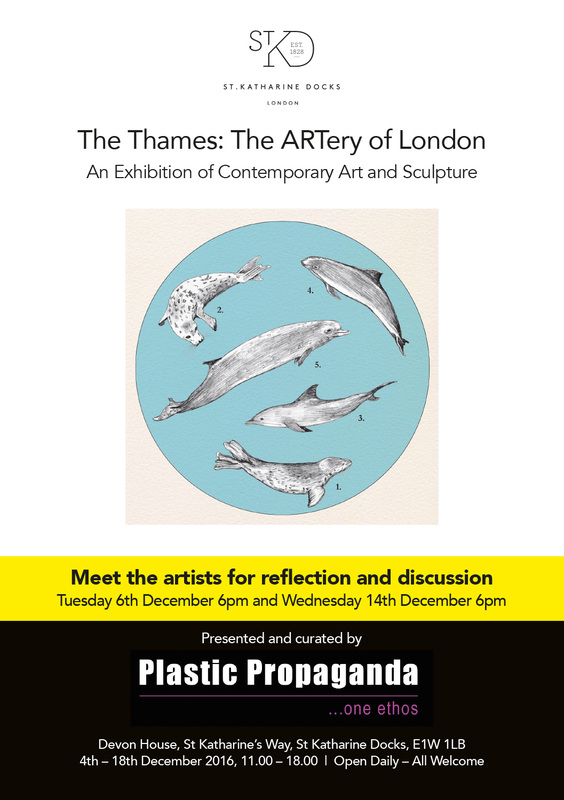 In partnership with Plastic Propaganda, the exhibition explores and considers the River Thames and its iconographical and symbolic character for a wide range of contemporary visual practice. Its intention is to explore themes, narratives, associations, histories, ecologies and ideas other than those necessarily realised through the literal and direct depiction of the Thames itself. The River Thames – its length, tidal reach, importance for trade and for the sustainability of the city’s recycled water resources – is a significant part of London’s natural and ecological landscape. Its name, taken from the Sanskrit Tamas, literally means dark, suggests perhaps a partly occluded or elliptical subject resistant to the gaze. But London is and has been typically identified by the snake-like image of the Thames, often used for navigation, whether from earlier, aerial analogue photography or through digitised satellite imagery made ubiquitous by search engines on our PCs. Beyond the immediate course and tidelines of the Thames itself there is a rich and expansive hinterland which indexes a history of continuous settlement from the Romano-British era through to the industrial period of the eighteenth and nineteenth centuries and the post-industrial present. For artists as diverse as Monet, Derain, Whistler, Roberts, Maitland, Gilman, Greaves and Turner, the natural iconography of the Thames itself and its adjoining architecture provided a creative impetus to their own aesthetic. Similarly, both the Tate Modern and Tate Britain might be conceived as site responsive interventions, the placement of which recognises and continues this history of immersive engagement. This group exhibition, The Thames: The ARTery of London has been organised and curated as a contemporary contribution to this artistic, social and cultural dynamic. There will be opportunities for private viewings and meeting the artists for reflection and discussion on Tuesday 6 December 6pm and Wednesday 14 December 6pm. All welcome. Plastic Propaganda is a not for profit collective that provides a supportive and visible platform for both new and established artists, organising and supporting exhibitions both nationally and internationally. The Thames: The ARTery of London exhibition will be open daily 11:00-18:00 4-18 December at Devon House, St Katharine’s Way, St Katharine Docks.